hueDynamic brings your Philips Hue system to life. Hue Entertainment Group Support for Disco and Camera! – The most responsive Hue API. Feel energized or relaxed with professionally designed experiences combining light and sound. Over 40 mixable and dynamic scenes with simple room and lighting group control, such as mountain chill, fireplace, jungle night, fire and ice, rainforest, fireworks and many more! Have the ultimate party with multiple advanced sound to light disco modes. Adjust strobe, intensity, hue and more! Camera support means you can point your device at your TV and sync your lights to your viewing for a truly immersive experience! Movie night has never been so good. Enjoy an advanced sampling mode – predominant multicolored with adjustable smoothing. Speed and brightness control is also supported. Transparent multiple bridge support (included) allows you to control all your lights across multiple bridges without having to switch between them. 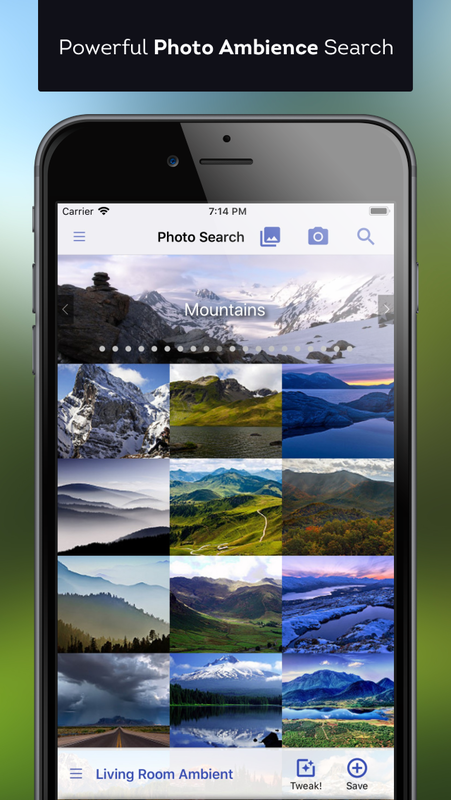 Create your own custom photo ambiences and enhance the colors with our “Tweaks!”. Photo ambiences are stored on the Hue bridge with our OmniScene technology, meaning you don’t have to recreate the ambience for different rooms. Not only that, they are accessible from all your devices running hueDynamic. Ever come home to have all your Hue lights on 100% brightness because of even a slight power outage or “brownout”? With the hueDynamic app, this is a thing of the past thanks to our Hue System Power Cut detection. 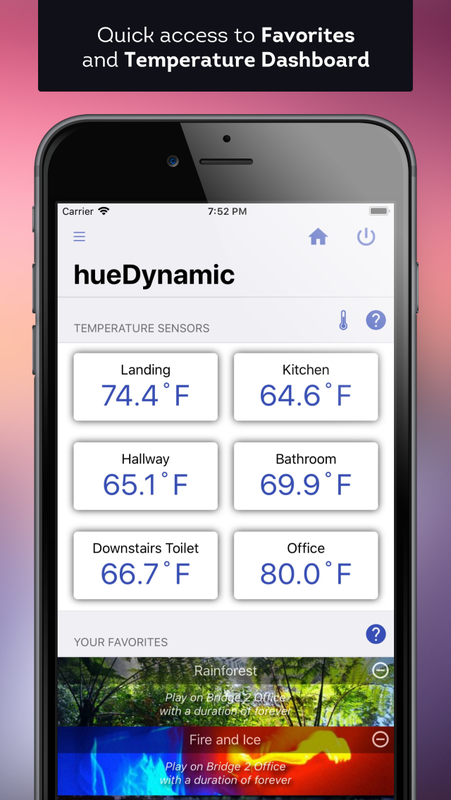 With a simple click, you can enable this feature in the hueDynamic app and your Hue Bridge will be programmed to recognize when its power has been disturbed. As soon as it has finished booting, it will then send a command to your lights and bulbs to switch them off for you automatically. This gives you piece of mind and also saves on electricity costs. Make your Hue Dimmer devices more useful with our advanced programming interface, with much more functionality that the official Philips Hue app. Unlock features such as multiple actions per button, toggle power with one button, cycle through ambiences, enable and disable color loop, cycle through brightness levels and much much more! 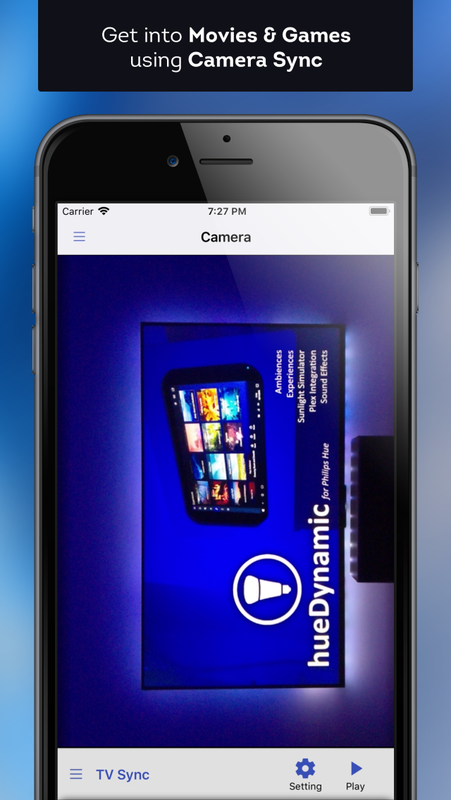 The hueDynamic app has a simple setup and linking with auto detection of your Hue system. We also love different types of hue lights, such as White Ambience and Phoenix, Osram and Dresden. We convert colors to appropriate color temperatures for lights that don’t support color in real-time. FEATURES INCLUDE: – Professional dynamic lighting scenes for your Philips Hue system, with stereo sound effects and music! – Natural sunrise & sleep routines – Camera support – Have your lights match your TV in real-time! Multiple color modes are supported. 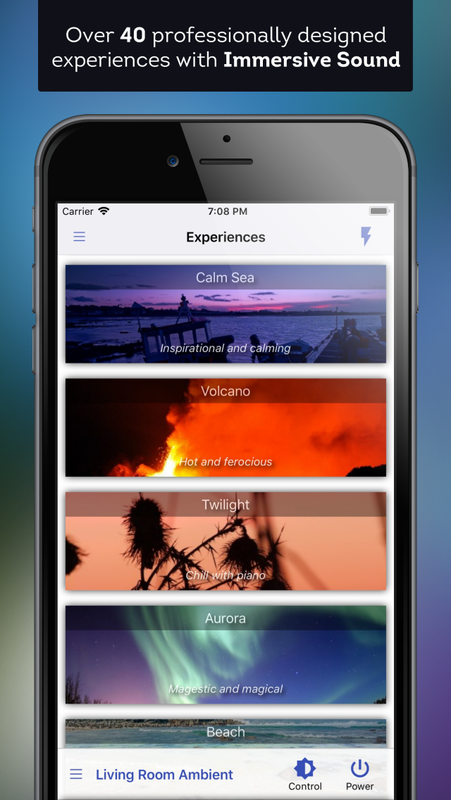 – Photo Ambience – Create awesome custom ambiences from your favourite photos with “Tweaks!” and apply them to any room! – NO in-app purchases for extra experiences or advanced features! – Power cut detection. Turns lights off after a power cut automatically. – Advanced Dimmer programming – Advanced sound to light DISCO modes (peak & spectrum) – Adjust response hue, strobe and much more! – Temperature dashboard. View the room temperature for anywhere that you have a Hue Motion Sensor. – Virtual Push-Link button. Add apps to the Hue bridge without having to physically press the button. – Easily link Ikea and other third-party bulbs with the TouchLink button built into the app. – Set an ambience or experience to run on a timer – perfect reminder for those long showers! – Real transparent multiple-bridge support. Add all your bridges and don’t switch! – OmniScene technology – Create ambiences and mix and use them on any lights without having to recreate them! – The app runs in the background to provide you with light and sound experiences on your Philips Hue lights and speakers, while allowing you the freedom of using your device for other tasks at the same time. 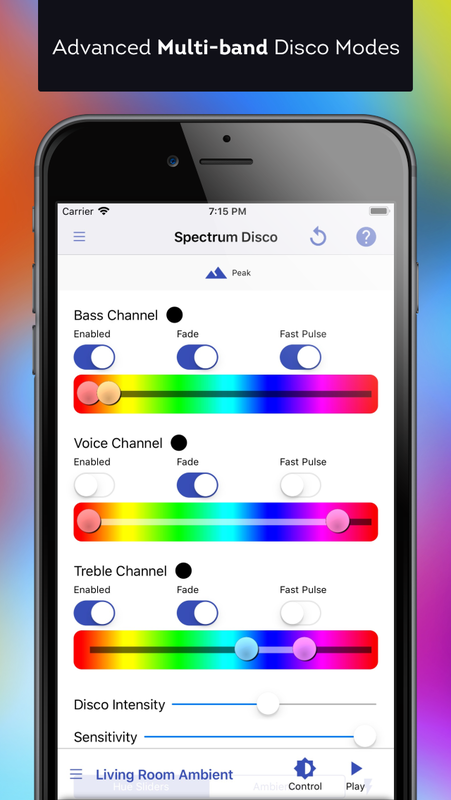 – When you activate the disco mode, the app listens to your music using your iPhone or iPad microphone. – Full compatibility with our desktop app.